Friends, neighbors and coworkers gather in the Hancock’s kitchen to grab some gumbo and watch the Saints play. Hurricane Harvey’s got nothing on the Hancocks. Even though the catastrophic storm displaced the couple from their Bellaire home in the fall of 2017, husband Charles and wife Chandel are back in their refurbished home on Mimosa Drive, ready to host the whole neighborhood for their traditional Sunday Saints watch party this weekend. 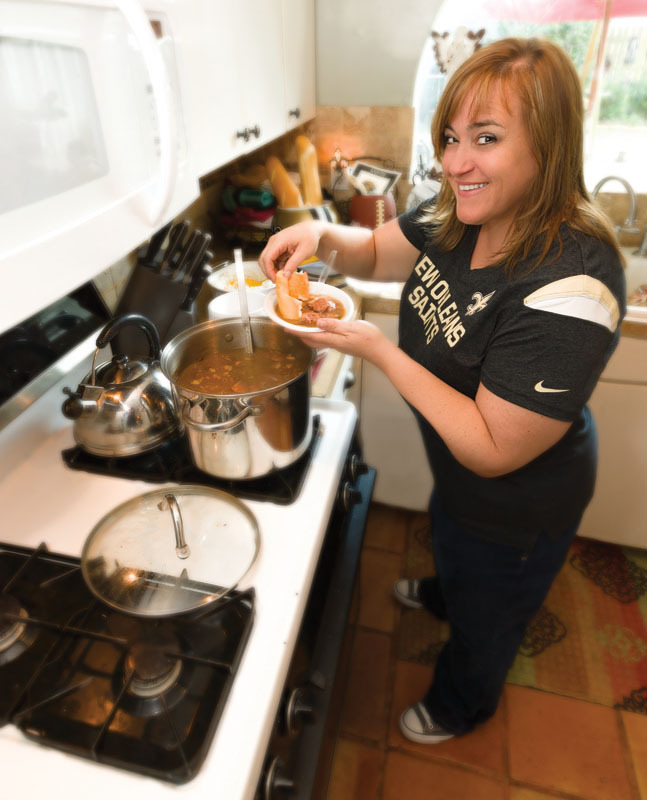 The couple first moved to Houston from New Orleans more than 20 years ago, and for about a decade before Hurricane Harvey hit, the die-hard New Orleans Saints fans would open up their home each Sunday during football season, welcoming more than 50 friends and neighbors into their home to cheer on the Saints and enjoy Chandel’s famous gumbo. The Hancock’s home suffered severe flooding after Harvey — they had more than three feet of water in their home — so the 2017-2018 football season was quieter than usual for them. The couple lived with their daughter in Bellaire for seven months while their house was undergoing repair, and while they still had some friends over to watch Saints games, it was not quite the same as hosting the whole neighborhood at their own home. 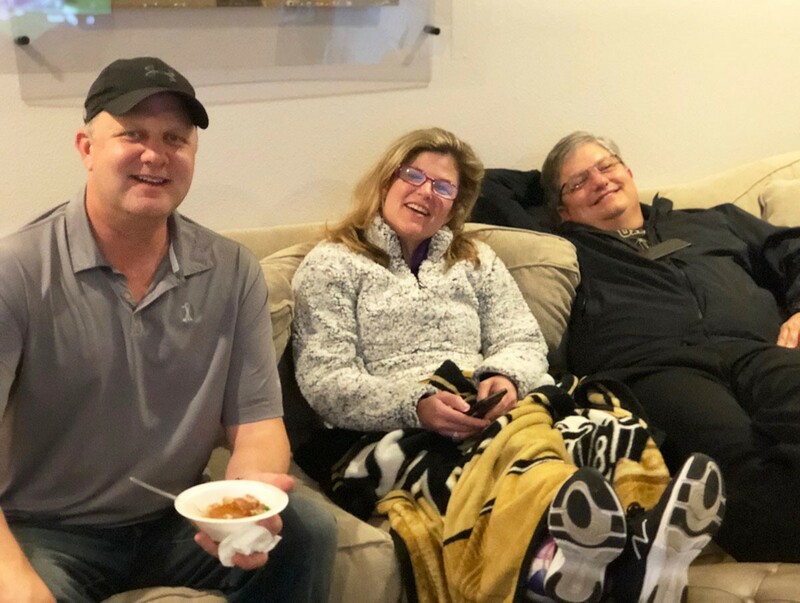 Last spring, the couple finally moved back into their home and when Sunday football started back up, they were back to hosting for Sunday Saints games. This past weekend, though, the Hancocks had most of the Sunday crew back, about 40 guests. The Hancocks usually put up Bubba, this inflatable Saints player, in their front lawns before New Orleans football games. Perhaps adding to the renewed energy is that for the first time all season, the Hancocks put up Bubba—a 6-foot-tall inflatable Saints player that Charles received as a Christmas gift one year. 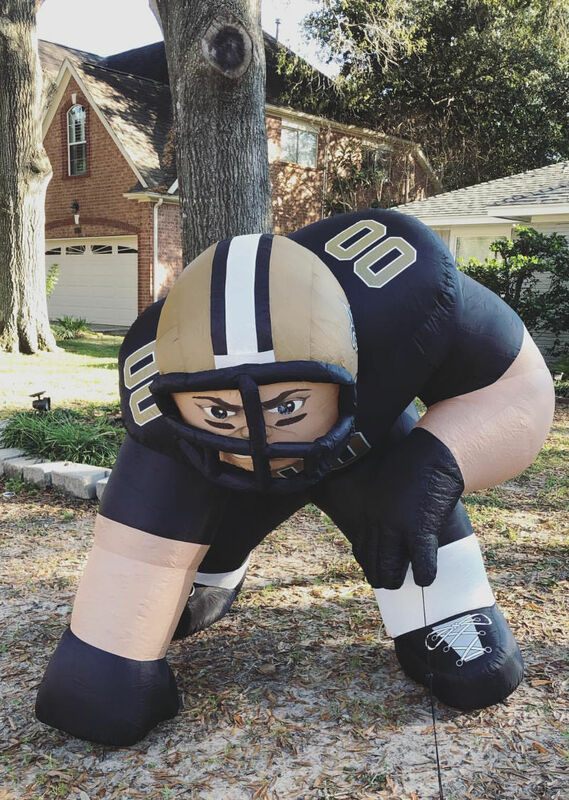 The inflatable player used to stand in the Hancocks front yard during every Saints game. But this year, it wasn’t brought out until last Sunday. Charles, who describes him and Chandel as superstitious fans, said he and his wife were hesitant to put Bubba this season, since the Saints had already been winning so many games without Bubba. “But we still put it up on Sunday and they won, so it’ll be up again this weekend,” Charles said with a chuckle. Charles and Chandel are hoping that the Saints clinch a victory against the Rams on Sunday and earn themselves a spot in the Super Bowl. 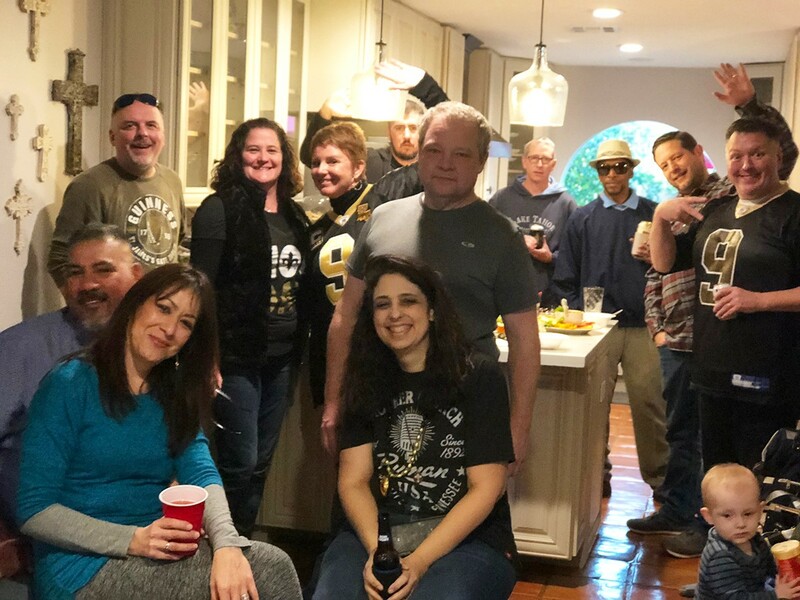 They are again expecting around 40 guests in their home—many of whom are neighbors who Charles and Chandel have converted into Saints fans over the years. But Charles says it’s not a requirement that the guests are Saints fans. The New Orleans Saints play the Los Angeles Rams on Sun., Jan. 20 at 2 p.m. The game will be broadcast on FOX. Read Football, Cajun Style: Saints and Tigers fans live among us by Dave Schafer, which was published in October 2014. And be sure to check out Chandel's gumbo recipe. 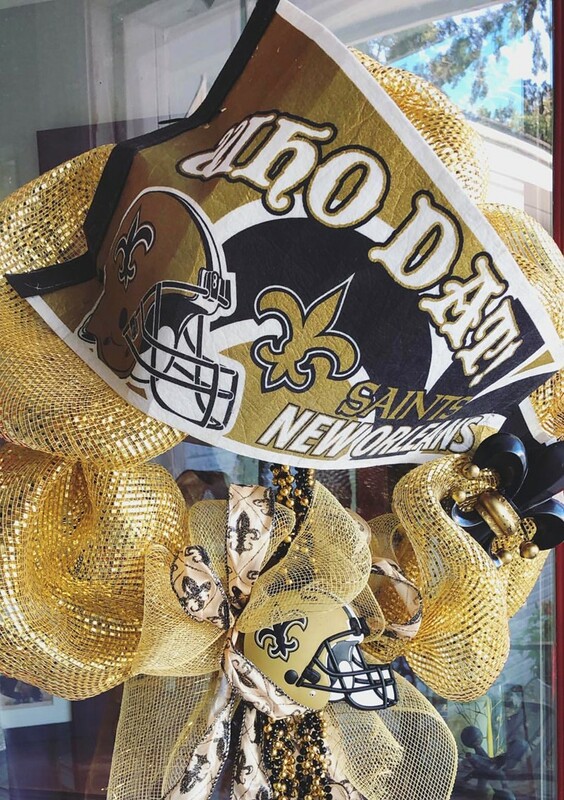 This Saints wreath, made by Chandal Hancock, hangs on the Hancocks’ front door from after Christmas through the end of the football season. “Which is hopefully in February,” Charles says. 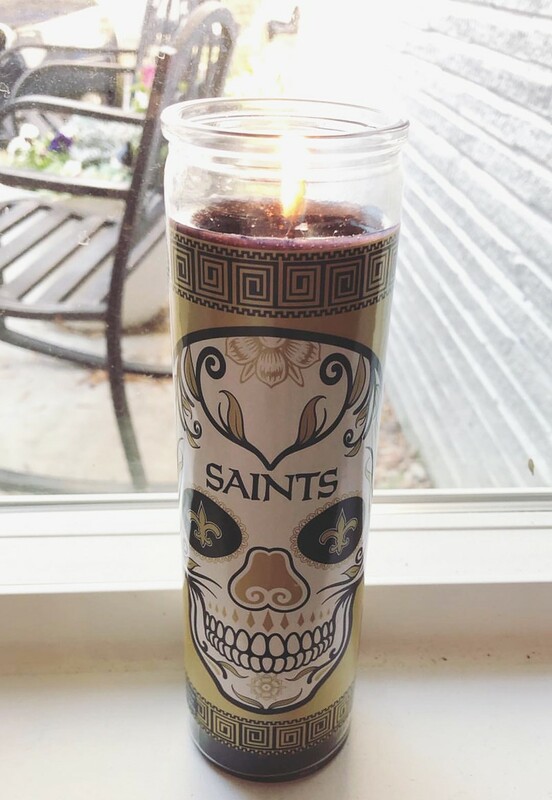 The Hancocks put out these “Saints prayer candles” when they cheer on their team.